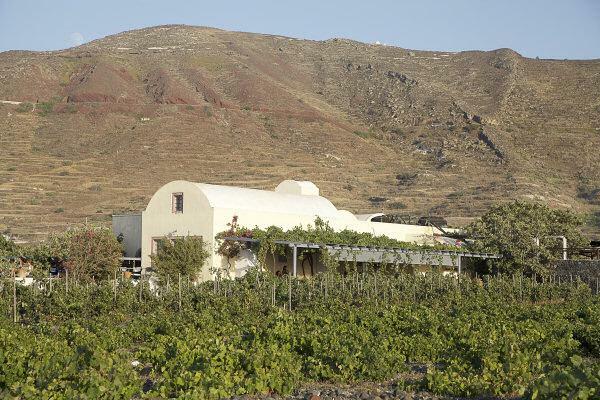 "Sigalas is one of Greece's finest white wine producers – in fact, a short list candidate for the best. I would like to take credit for that conclusion, but there is not much dissent here. This producer is universally acclaimed for his skill with Assyrtiko of all types – dry, barrel fermented and sweet – and I can only climb on the bandwagon. Sigalas is simply a master with this grape." The winds saturate the island throughout the year. The only way for the grapes to survive from the direct exposure of sun and strong winds is to be protected inside low-basket-shaped vines, the "ampelies", as they are called locally forming a unique pruning system. The refreshing northerly winds that blow from July to September, known as the "meltemia", also help keep the vines from developing the numerous fungi that can result from the combination of summer heat and humidity.